Threaded Dowels. 325 plus pieces. Furniture Parts Salvage. For God so loved the world that He gave his one and only Son (Jesus), that whoever believes in him shall not perish but have eternal life. (John 3:16) <><. 3011 Beautiful 19th C. Eastlake Antique Sofa. Style: Eastlake. 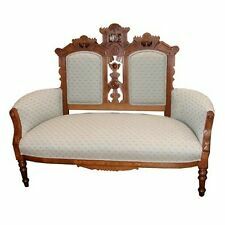 Beautiful 19th C. Eastlake antique sofa featuring burled wood and nice carvings. 5602 Pair of 20th C. Upholstered Armchairs. Great pair of 20th C. armchairs upholstered with a nice fabric. Country of Origin. A set of 3 grain-painted Victorian caned chairs. Overview of Chairs. These chairs are in as found condition. Chairs #1 and #3 are generally solid, chair #2 wobbles. The cane in chairs #1 and #3 is good; the cane in chair #2 has 3 small holes (see photo). 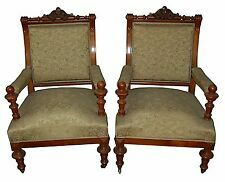 5521 Pair of 19th C. Renaissance Revival Armchairs. 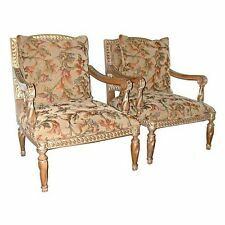 Beautiful pair of 19th C. Renaissance Revival armchairs in original condition. Renaissance Revival. Country of Origin. 465 Victorian Parlor Set by John Jelliff c. 1885. John Jelliff. 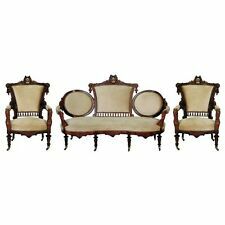 3-piece walnut antique parlor set by John Jelliff. This set has one sofa and two armchairs each with a beautiful bronze head on the crest and carved Jenny Lind heads on the arms.